Crows are one of the hardest working punk rock bands in the business. This is a band playing the long game, even though their talent was spotted over 6 years ago by the likes of the NME and DIY Magazine, the band have dipped in and out of the limelight. Dropping their 5 track EP Unwelcome Light in 2016, it’s nice to finally have a bigger body of work from them, with their new album Silver Tongues. As expected from a band that delivers shows full of pure energy and defiance, Silver Tongues is a noisy piece of work, with 10 unashamedly loud tracks. Lead singer James delivers vocally as the rest of the band stand their ground and accompany him with polished guitars, drums and bass on every track. For long-standing Crows fans, the album includes older tracks from the band’s discography such as ‘Silver Tongues‘ and ‘Hang Me High‘, as well as live show favourite ‘Crawling)’. This is an album that for me, feels like the start of something bigger. It’s a great foundation for the band to build on. 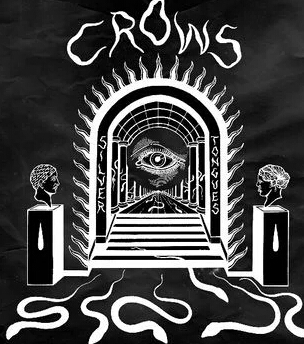 If you’re looking for the future of genuine punk rock, then Crows are definitely your band, but this might not be the album that showcases the entirety of the band’s talent. Take Silver Tongues as a solid tip of a very talented iceberg. So I’m intrigued to see what entirely fresh material will follow up from this album. Silver Tongues is still an album that should be turned up loud and fully enjoyed! Stand out new tracks include ‘Tired & Failed‘, which showcases a vulnerability in both its music and lyrics that I wasn’t expecting from the band, and ‘Chain of Being‘ which is the true manifestation of the Crows sound. ‘Hang Me High‘ and ‘Crawling‘ also remain firm favourites. Silver Tongues is released on 22nd March through Juno Records.